Guizhou Province is widely known for its beautiful scenery and culture. It is also a perfect haven for a winter retreat to ski, eat hotpot and, for some, a hot spring skinny dip. Young men play the lusheng, a reed musical instrument, during the Lusheng Festival, one of the most significent fests of the Miao people. Guizhou Province, in southwest China, is widely known as an ideal destination for travelers wishing to explore its rich resources, beautiful scenery, waterfalls and mountains. And while winter might not be the best season to visit the province, it does have something unique to offer. According to the latest national population census, there are 54 ethnic groups in Guizhou. Throughout the centuries the multi-ethnic population has formed a mixed but unique folk culture. One notable feature is that the festivals and celebrations are different from those of the Han people, and many of them occur in winter. The Lusheng Festival is one of the most significant festivals of the Miao people. 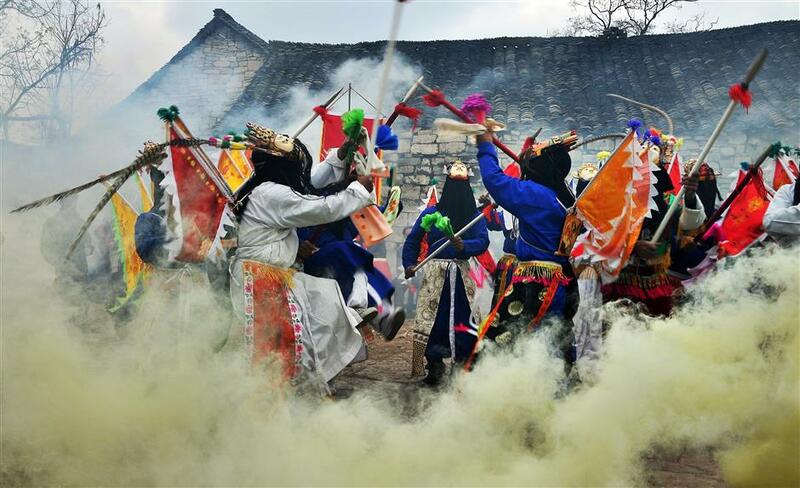 It is usually celebrated in Zhouxi, an area near Kaili, Majiang and Danzhai. People from different places celebrate the festival at different times, but mostly in January or February in the lunar calendar. The origin of the festival is largely unknown, but it is widely believed that it came from the ancient people’s wish for a good harvest and the worshiping of pagan gods. 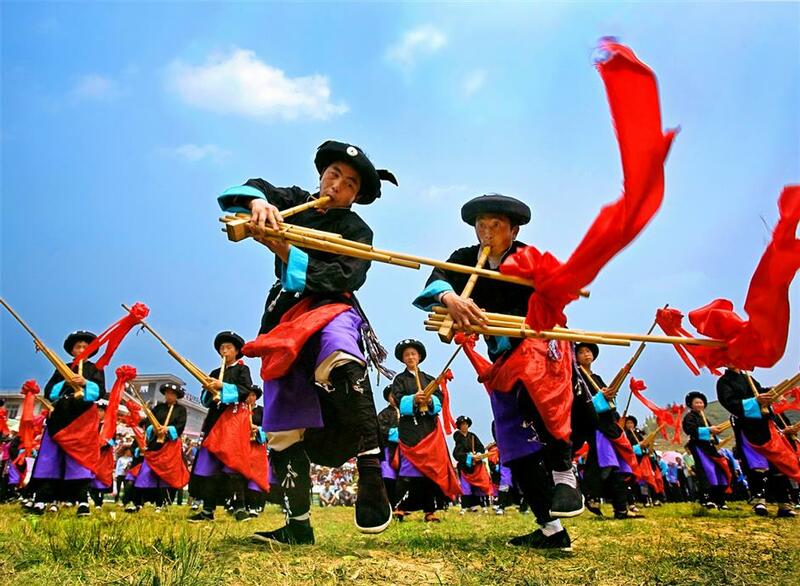 The festival’s name comes from lusheng, a type of reed musical instrument that is popular in southwest China. After a worshiping ceremony for familial ancestor, young people in ethnic outfits will take their lusheng to the square for a party. At the square they will form a circle and dance while playing the instrument. The party will go on for days, and visitors are always welcome to join in the celebrations. Local people perform Dixi Opera, a unique folk theater in Tianlong Tunbao Town, which is close to Anshun City. People of the Dong ethnic minority perform folk songs in Qiandongnan area. Nothing is better than hotpot in a cold, damp winter. In Guizhou, hotpot is given different definitions and names, but the essence is the same: To put fresh, raw food in hot soups and get them cooked within a short period of time. In the area around Tongren, hotpot usually means paotangrou, which is usually served as a Chinese New Year’s Eve dinner. The dish is generally made from an entire swine freshly slaughtered. The soup is cooked with chitterlings, while the pork is stir fried with other offal before being put into the soup with chilis, garlic and raw vegetables. In Guiyang and Kaili, everyone loves fish in sour soup. The dish originated from the Miao people, but there is no standard recipe for making the soup. The most traditional types are the “red soup” made with pickled wild tomatoes and “white soup” based on fermentative rice water. There are several other ingredients used in sour soup, such as the pungent litse fruit, taro, chili, ginger and garlic. Good sour soup needs hours of cooking as it determines the final taste of the dish. The fish, usually catfish or grass carp, is put into the sour soup and served raw. While waiting for the fish to be cooked, people usually add vegetables to the dish, which taste delicious after absorbing the juices of the pot. Hot springs are generally common winter attractions, but in Guizhou some of them are quite different from those in other regions. The Shiqian Hot Spring, in Shiqian County, is one of the oldest natural hot springs in China. The facilities were built more than 400 years ago by a Yunnan native named Jiang Dakun, who was the prefect of Shiqian. Local people believed that a dragon, driven by a man from Yunnan, made the hot spring. Legend has it that the man loved Shiqian so much that he settled down there and kept the dragon under the river. The hot spring is known to be one of only a few drinkable springs in the country. Flowing from the Songming Mountain, the water, which is around 45 degrees Celsius, contains rich minerals and microelements that reduces blood pressure and soothes the nerves. The Jianhe Hot Spring, in Qiandongnan County, is called “the holy waters of Miao people.” Before the hot spring resort was built in 1989, the Miao people loved to bath in outdoor springs without any clothes on and still do so even today. They believe that it is natural to make contact with the nature without barriers and insist there is nothing to be ashamed of. There are two spring pools set up for them, one for men and one for women, so that they can continue that tradition. Other visitors are required to respect the practice and not to peek. The hot spring is the only one in the country that contains hydrogen sulfide and radon. With the other elements, the waters help to regenerate the skin and strengthen the nerves. Shiqian Hot Spring: There are shuttle buses from Tongren to Shiqian Bus Station, where several buses are available to the hot spring resort. Jianhe Hot Spring: From Kaili, a small city near Guiyang, capital city of Guizhou Province, buses are available to Jianhe, where shuttle buses go to the hot spring during the day. Snow can be fierce in Guizhou in wintertime but it also provides great conditions for skiing along with the mountainous landform. Five resorts provide different types of snow entertainment, including alpine skiing, snowmobile and a flying saucer. 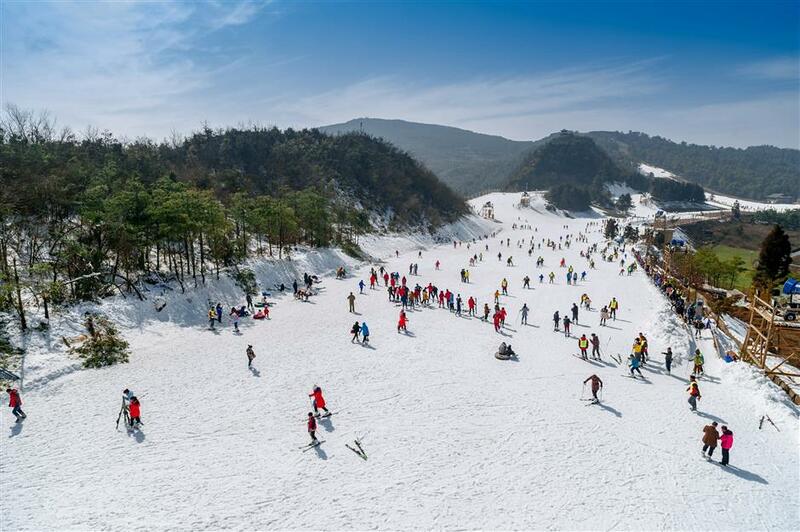 The Daloushan Ski Resort, in Zunyi City, might be the most ski-friendly. It has 30 professional instructors, and all skiers get a free 15-minute lesson before getting on the tracks. The Yushe Forest Ski Resort, in Liupanshui, has campfire parties at night where there are folk dances and local delicacies to enjoy. The natural view in the park also provides a breathtaking winter setting with icicles on trees and mountains, which are not frequently seen in southern China. The Yunding Ski Resort, in Guiyang, has a grand barbeque site that offers roast lamb and other local dishes. As the resort doesn’t have accommodation facilities, visitors can rent tents. 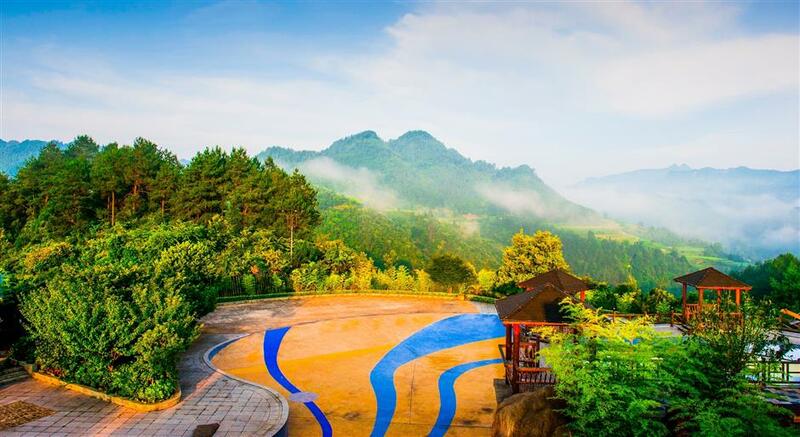 Daloushan Ski Resort: Drive along the G75 Highway and take the Taibai Station Exit, turn left and drive towards Huanglian Township for around 30 kilometers to the resort’s parking lot. Shuttle buses are available at the parking lot. Yushe Forest Ski Resort: The resort is about 30 kilometers from downtown Liupanshui and it is easy to call a cab from there. Yunding Ski Resort: Two shuttle bus stations are available in downtown Guiyang, at Zilin’an and Haguoyuan areas. The departing time at Zilin’an Station is 9:30am and 11am, while at Huaguoyuan is 10am and 11:30am. The returning buses depart at 4pm and 6pm.